D’Angelo Russell wasn’t well liked after his incident with Nick Young and his ex, rapper Iggy Azalea. Just to remind you, Russell posted a video of his former Laker teammate talking about cheating on Iggy. Russell was ripped by social media, calling him a snitch while others praised him for it since cheating shouldn’t be a good thing. He denied he posted the video. Russell, now a Brooklyn Net, seems to be saying too much already. Granted, it’s not about another woman but a new teammate. According to NY Daily News, Russell was asked about a workout video in a introductory press conference and he replied, “The workout was last night. Caris (LeVert) was supposed to be there, but he wasn’t”. It’s not that serious but the incident in LA will follow him. 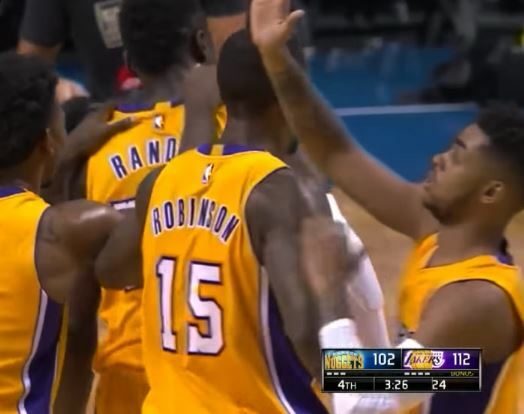 Lakers claim he was not traded because of the tattling.